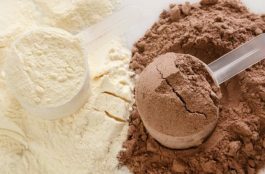 Brown vs White Rice in Bodybuilding – The Facts! Rice, an edible grain, is a dietary staple in many parts of the world. Though there are roughly 40,000 varieties to be found across the “rice spectrum” – for example, have you heard of “Wild Rice”, or “Himalayan Red Rice”?, or “Swamp Rice”? Most of us associate the word “rice” with either “brown” or “white”, generic terms referring to the color of the grain, and a source of contention among anyone who enjoys, or is simply goaded into, arguing about the superiority of one over another. Common “knowledge” has it that brown rice is good for you and white rice is bad. 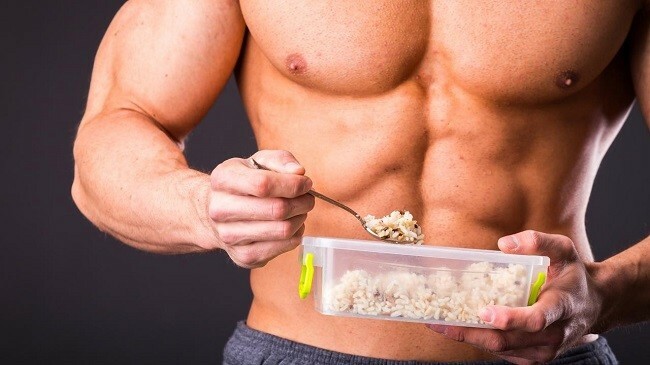 After all, white rice, in all its sticky, anemic, high-glycemic awfulness can’t possibly be of benefit to anyone trying to shed fat, increase lean mass or improve their athletic performance. Just looking at a bowl of it makes you flabby. Foods can be classified by their GI – their glycemic index – which is based on how quickly a given food causes blood sugar levels to rise. It’s quite simple: a higher GI food is digested more quickly, with a resultant high spike in blood sugar. Conversely, a lower GI food is digested more slowly and causes a less dramatic spike in blood sugar. Lower GI foods, such as brown rice, are believed to be the superheroes which result in satiety, aid in fat loss and prevent disease. White rice is higher on the glycemic index than brown rice, which is why it is seen as a “bad guy” by comparison. That white rice is a higher GI food is indisputable, even when variables such as the specific varieties of the grain are introduced. Let’s talk about “real world” results. A food’s GI score is assessed based on its effect on blood sugar when it is consumed by itself after fasting overnight. Just to make this clear, that means that a food’s effect on your blood sugar is only of great significance when it is eaten at the start of the day, without anything else, ie, a bowl of plain white rice for breakfast, which is not a realistic scenario. 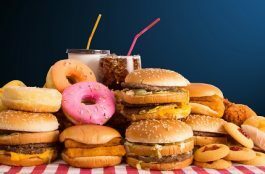 It’s more likely that there will already be other foods in your stomach, the presence of which will slow the digestion of, and subsequent spike in blood sugar caused by, white rice. Other macronutrients effectively lower the glycemic index of a whole meal, at which point there is no significant GI-based difference between brown and white rice. By now, the kafuffle about the glycemic index being a reliable way to classify food as “good for you” or “bad for you” begins to fall apart. For example, eating white rice, vegetables drizzled with olive oil and a piece of chicken breast combines the three macronutrients – carbs, fat and protein – in a manner that results in a lower GI than even a bowl of brown rice alone. I used Nutritiondata.self.com to compare the glycemic load of brown rice and white rice. 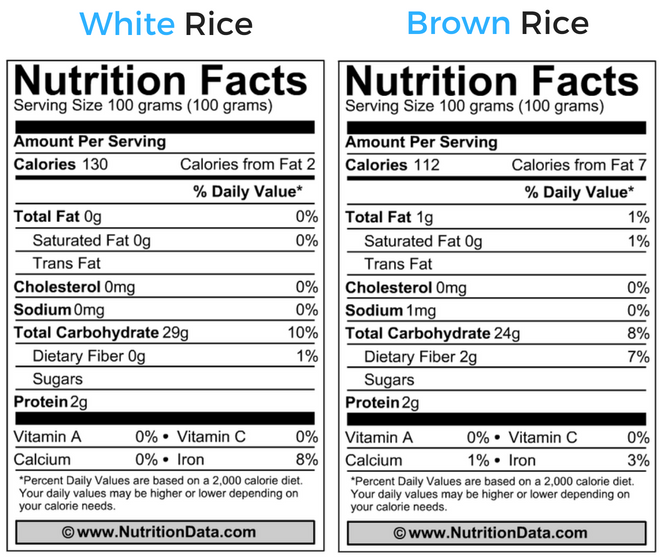 I found that comparing 100g of each, brown rice had a glycemic load of 11 and white rice had 15. This shows that there is really not that great deal of a difference in terms of the impact on blood-sugar levels between the two. Okay, so the Glycemic Index is out… What About Nutrients? Brown rice is so much “more nutritious” than white. Try again. 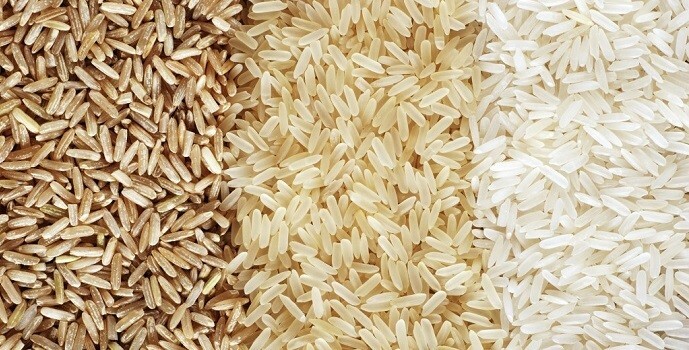 An analysis of popular brands of white and brown rice showed virtually identical nutrient profiles, with brown rice beating out white by an insignificantly small margin of roughly 1 gram more protein and fiber per serving, a difference which can more than easily be negated by simply consuming additional foods instead of living off of rice alone. As for micronutrients – minerals and vitamins – brown rice has a slight advantage over white. See, what makes white rice white is that its hull (the outer layer) has been removed. This layer is where the micronutrients reside. As a result, much white rice is enriched with the micronutrients which are lost when it is processed. Regardless of such enrichment, the amount of micronutrients missing from white rice are, for the average person, negligible, since we’re not about to suggest a rice-only diet. Finally, brown rice – suddenly not looking so amazing after all – contains substances called phytates, which act as anti-nutrients, actually decreasing the bioavailability of the micronutrients inherent in the hull. Here is a comparison of nutrition labels per 100g; you’ll find that there is not much between them. White rice is digested more easily, in terms of a lack of bloating, gas, cramps, bowel problems and other such discomforts, than brown rice. For those with a sensitive digestive system, this matters. Arsenic is a tasteless, odorless element which occurs naturally in the earth’s crust. The effects of arsenic poisoning include stomach pain, hand and foot numbness, digestive upset, thickening skin and swelling. All rice contains some arsenic. In fact, many foods we eat regularly contain some arsenic, and for the most part, the amounts we ingest are small enough to be of no great concern. However, if you had to choose between foods with more or less arsenic, presumably, you would choose the latter. Brown rice contains significantly more arsenic than white. That’s right – the “healthy” outer hull (full of micronutrients and anti-nutrients which essentially negate their benefits) allows it to retain a greater amount of arsenic. In the end, it appears that it’s a pretty even match. But recapping everything we’ve discussed, the differences between the two are fairly small. What it comes down to is that if a person tolerates or prefers brown rice, by all means, they should eat it. If they prefer the taste of, or have better tolerance for, white rice, by all means, they should eat it instead. And most importantly of all, rice should be used as part of a balanced nutrition plan that gives you all the nutrients you require.